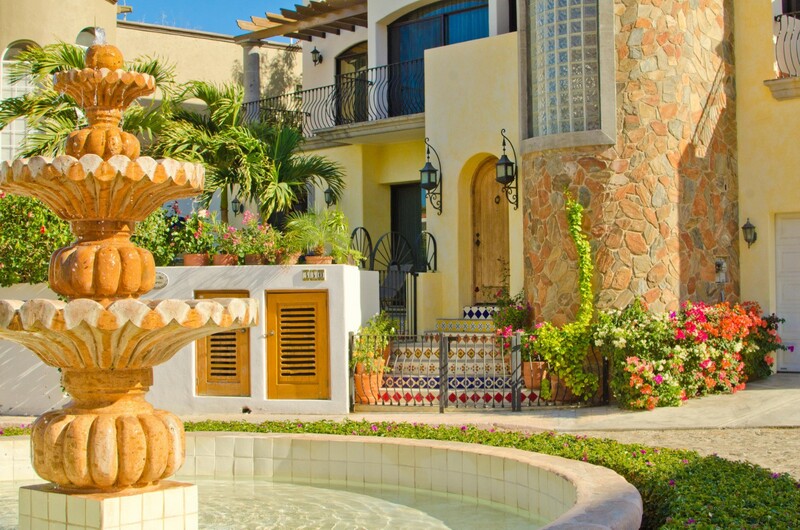 A short walk to the delights of Cabo San Lucas, the Villa de Tres Hermanas is a visual delight in addition to a perfect spot for a Los Cabos holiday. 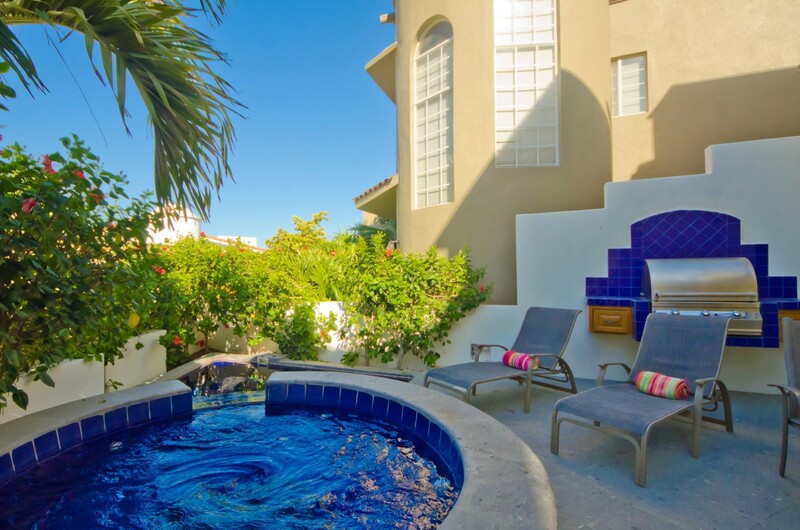 Most guests marvel at the looks of the property, with its charming garden, colorful tile work, unique dome and use of stone, wood and stucco in innovative and appealing ways. Stepping into the private garden, visitors are instantly won over as it is the focal point of the property. 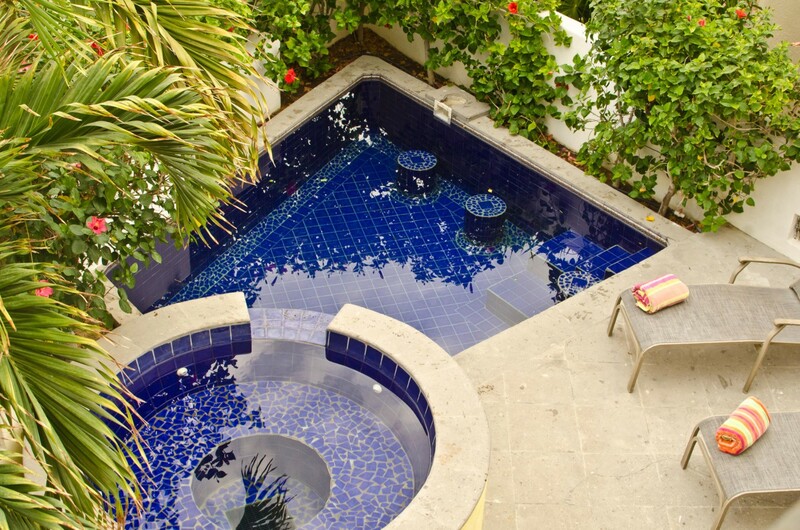 It hides your private pool terrace and Jacuzzi, both done in a stunning and rich blue tile. The wrought iron balconies above and the beautiful blue of the courtyard walls makes this entire space a soothing, dream-like space. 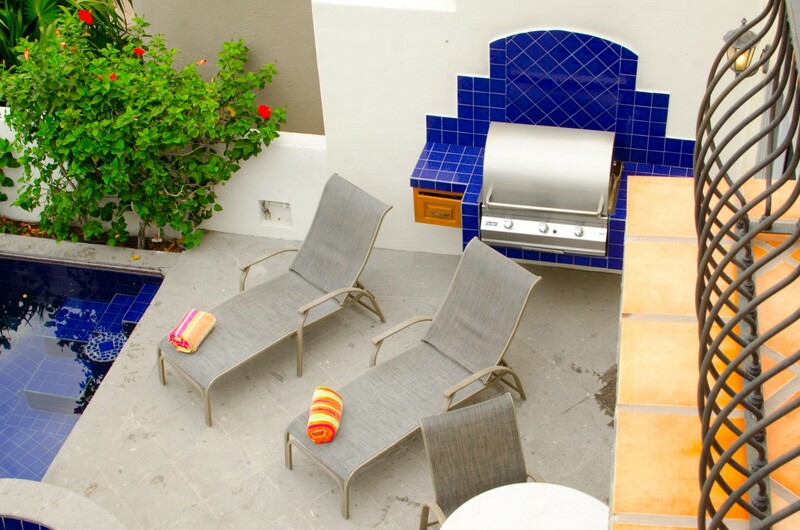 It also features a full barbecue and lounge area in addition to the sun deck. The interior spaces are as colorful and appealing as those outside. The great room boasts the same deep blue and terra cotta palette as the exterior of the villa, and it features the cozy dining area, the living room with banquette sofa and entertainment system, and the fantastic kitchen. 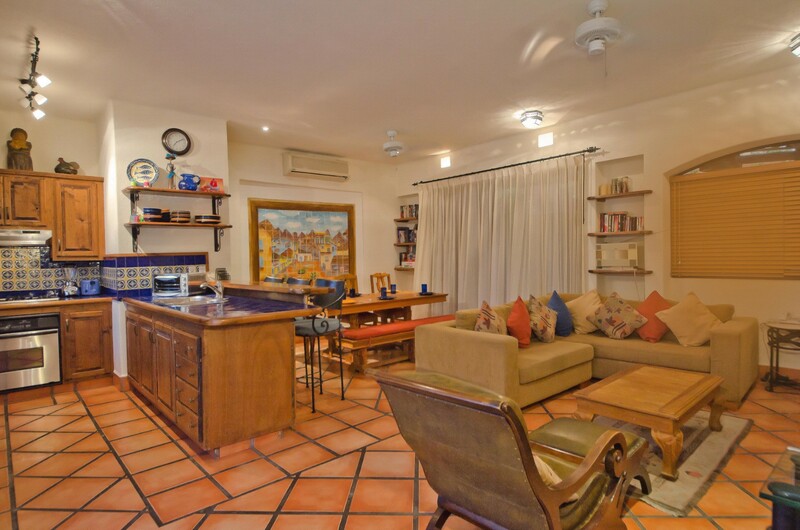 With its gorgeous tiles and old world cabinetry, it provides you with a fantastic work space that opens to the barbecue area of the pool terrace. 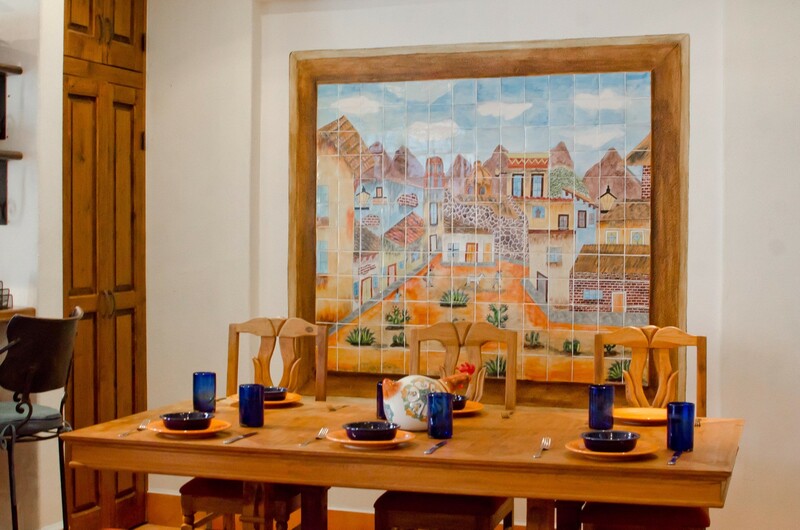 Throughout the entire property native and rustic art adds bursts of color and fun. The four bedrooms are divided between two floors. 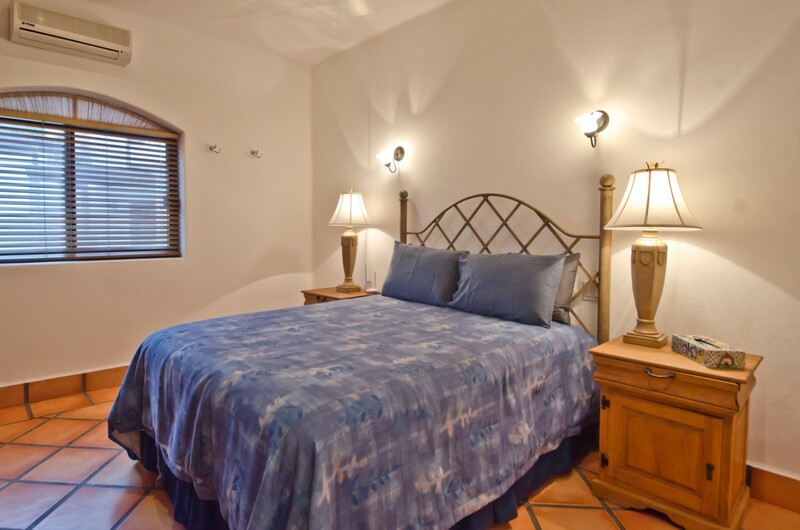 The master suite opens to a patio area beneath a palapa and features a king bed and large, private ensuite bath. There is a second king suite with balcony and private bath, and the two remaining suites include a queen suite and a dual twin suite. These share a large bath and one opens to a balcony area. 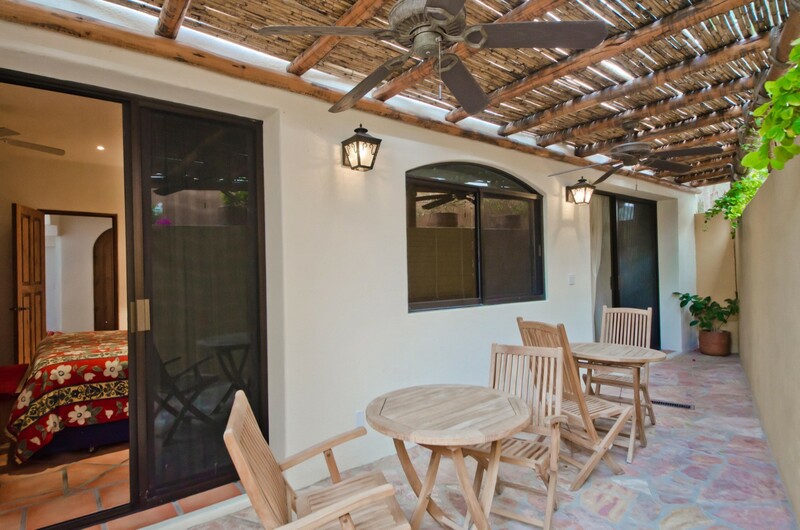 The Villa de Tres Hermanas is close to everything and yet a fantastic little world of its own to use as a base or your sole destination in Los Cabos. 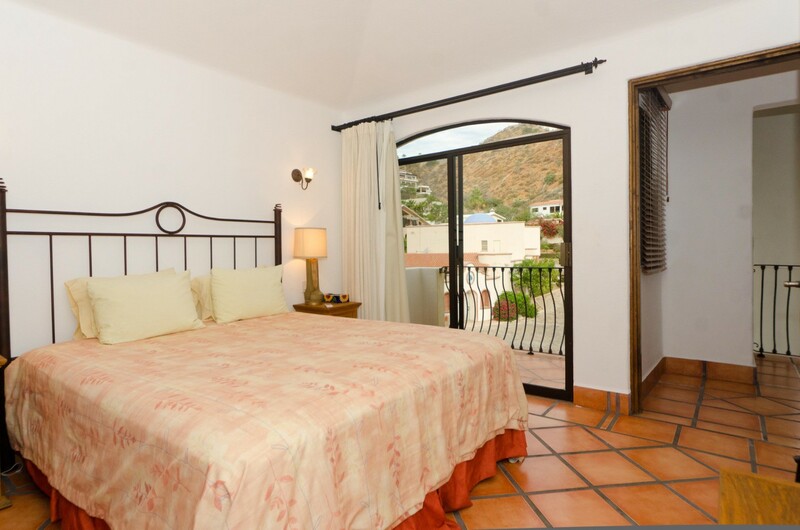 Bedroom 1: Master bedroom with a king-size bed, access to the patio and en-suite bathroom with vanity and wc. 2 guests maximum. Bedroom 2: Bedroom with two twin beds, access to the balcony and shared en-suite bathroom with vanity and wc. 2 guests maximum. Bedroom 3: Bedroom with a king-size bed, access to the balcony and en-suite bathroom with vanity and wc. 2 guests maximum. Bedroom 4: Bedroom with a queen-size bed and shared en-suite bathroom with vanity and wc. 2 guests maximum. ADW insurance required. Covers up to $3000 of accidental damage. Exclusions apply. Cost range is between $59 to $99 per reservation. 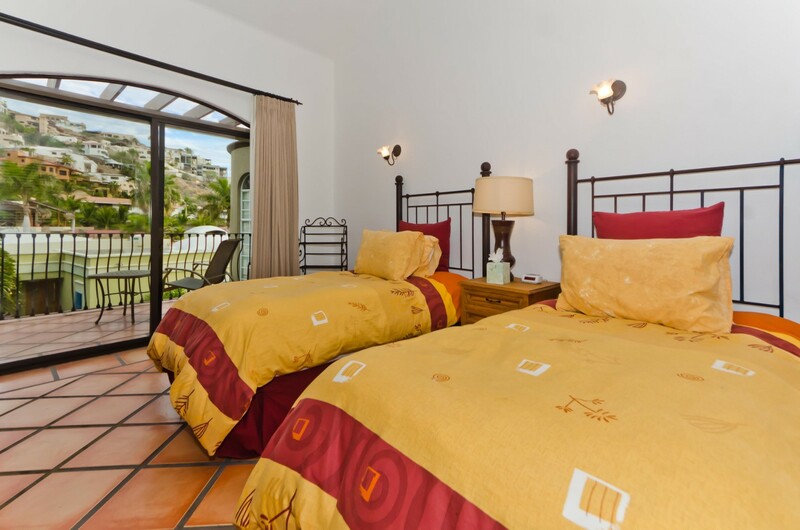 Book a villa between 2/14/19 and 6/30/2019, for travel from 04/01/2019 through 6/30/19 and receive $200 credit good toward Pez Gato catamaran tours while supplies last, in addition to our complimentary villa extras! US$600 worth of FREE Extras! - Dedicated local concierge during your stay. Great place to stay. Very close to the ocean and nearby shops and bars. The listing does not do the house justice. The location is amazing and very close to everything you need, the closest market was only a 5 min walk through the gate and everyone was very friendly. The house was beautiful! Every room was so comfortable and included AC, the pool and hot tub were the perfect touches. We spent every day out there with music and blending margaritas and enjoying the amazing view. Transportation to and from anywhere you need to go is very easy with the concierge service and everyone was so accommodating. 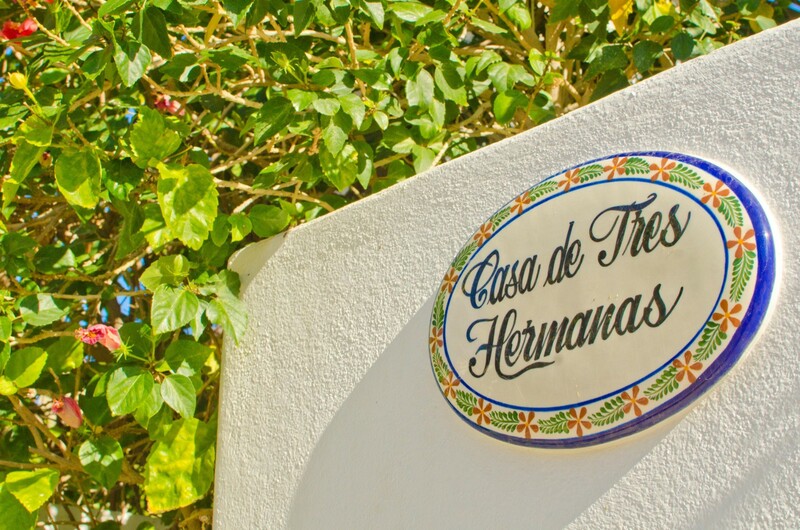 I would highly recommend staying at Tres Hermanas and I can't wait to be back. 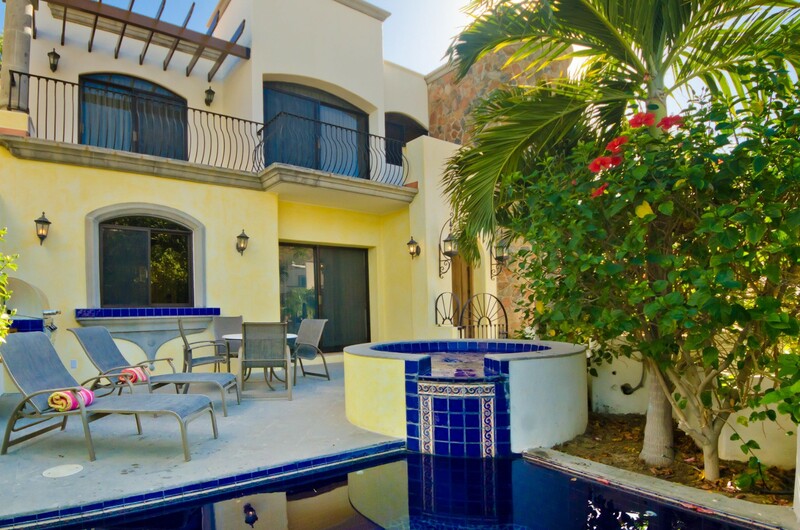 This villa was absolutely PERFECT in every way--great location, beautiful space, amazing views from the pool, and the staff were so lovely and helpful. We would absolutely recommend staying here! Perfect property for our family of 8. 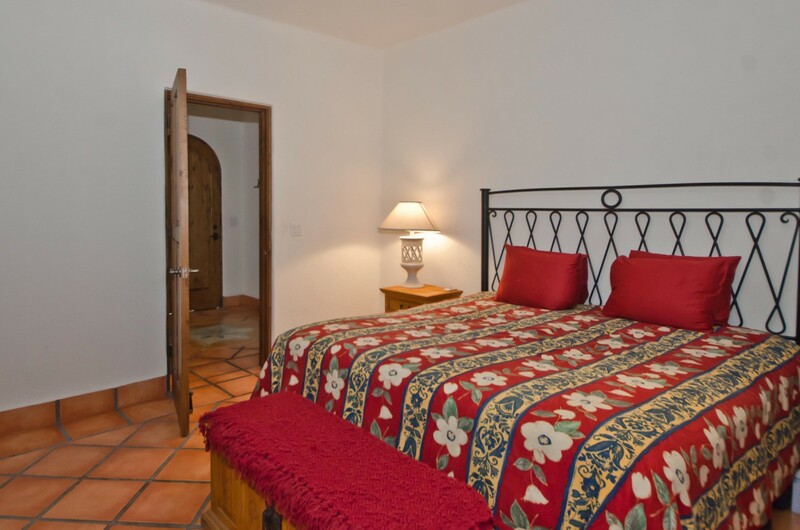 Plenty of bedrooms, bathrooms and seating. 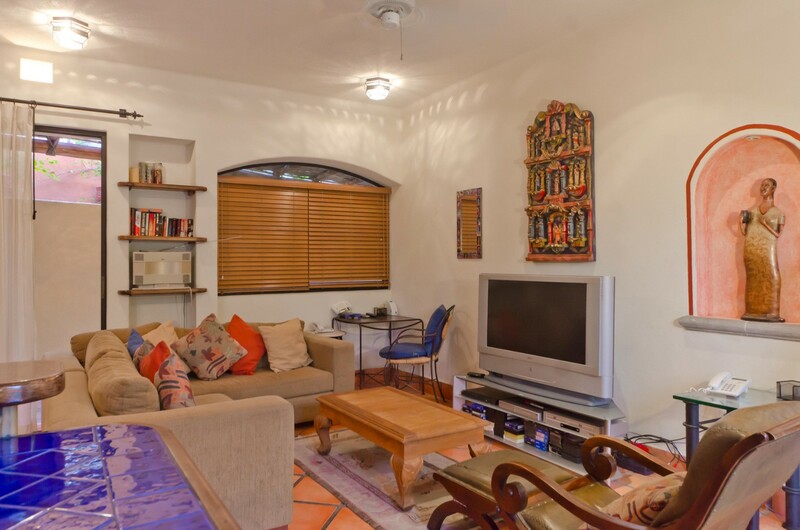 15-minute walk to marina, beaches and town. Quiet. 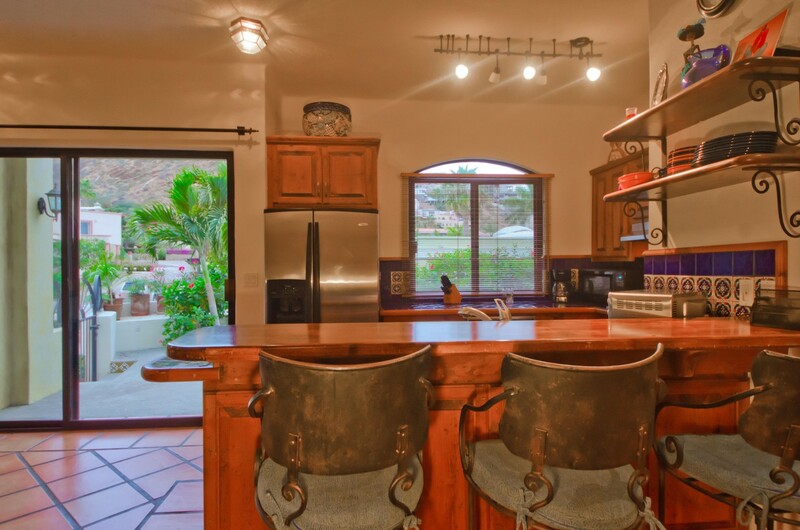 Well-equipped kitchen and thorough housekeeping every other day. Concierge promptly delivered a new grill lighter upon request. Fabulous hot tub and pool for the young kids. Certainly recommended. The house itself was very spacious and clean. The staff who met us at the house was very friendly. There was a concierge that was promptly available via phone. 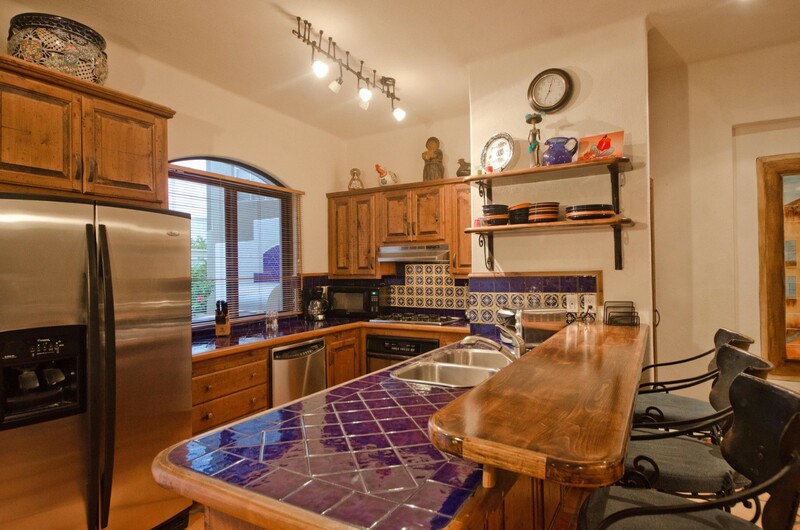 The location is within walking distance to the marina and near downtown. I would recommend taking a taxi to the night life (Squid Row, Mandala, etc.) 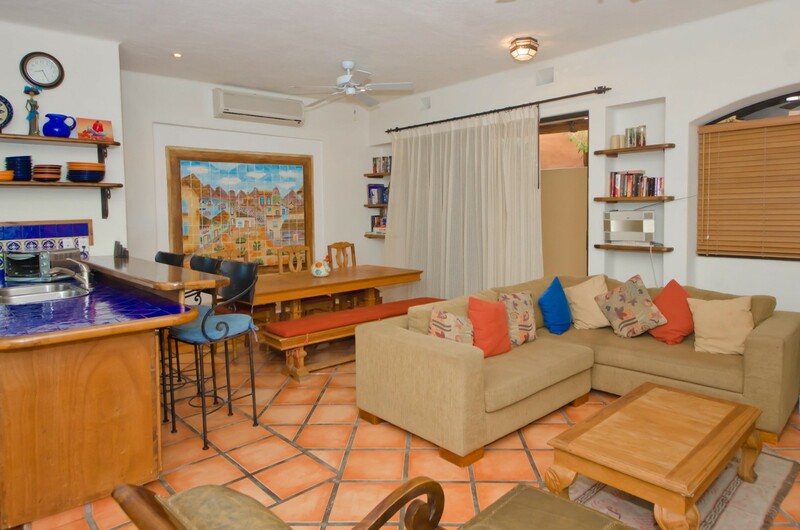 as well as to Medano Beach area as it is quite a bit of a long walk; however, taxis are readily available and easy to catch if you simply walk down the street from the house. 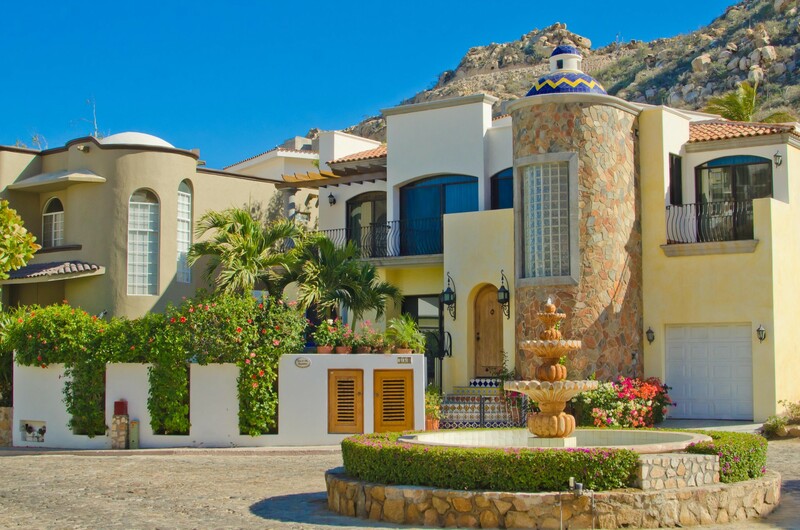 I would definitely stay at this house again if I come back to Cabo! My family and I had a great time at the Villa de Tres Hermanas. 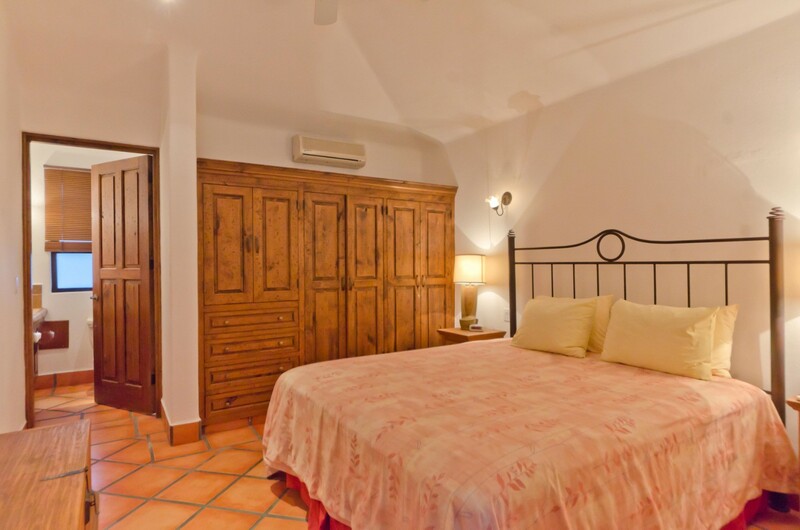 The rooms were beautiful with great storage and closet space. The pool and jacuzzi were great to relax in after walking around downtown Cabo shopping and trying different restaurants. We were under the impression that we could walk to the beach in 10 minutes but that wasn't necessarily the case. It would have been a longer walk IF we walked. So we ended up walking about 10 minutes to the marina/pier and taking a water taxi to the Medano beach, which cost us $5/person. Overall we had an amazing time and I'd go back.